Making the experience of spiritual torture under a regime intolerant of any freedom of expression, Vahram created figures (some of them seemingly hermaphrodites) originating in the past, in the Middle Ages, but, permeating the present, they dwell in the instable, unreliable and illogical components of the future. Here time is ensnared in transgression’s net and life becomes a passtime, a performance or a juggling. This compulsory condition transcends the spheres of time and space and stretches out on other dimensions, where the escape from the daily nuisances and anxieties does not contribute to the inner tranquility of the human being. Rather they continue to live and labor in super‒prudent and alarmed psychosis. 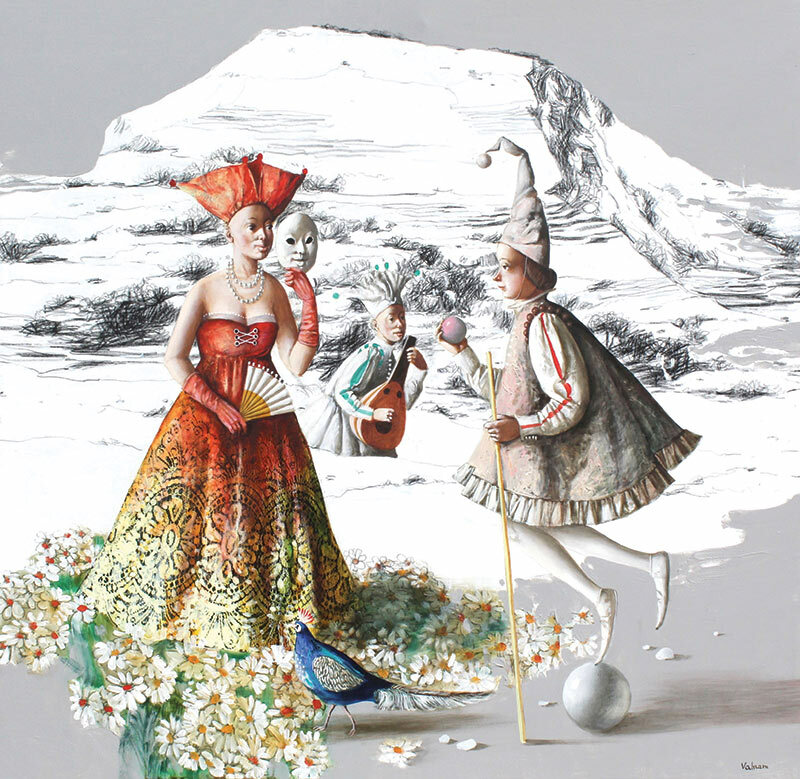 Vahram strives to ignore the present or surpass the reverberations of innate atavism, but metamorphosed faces, whimsical bodies and fantastical circumvolutions portrayed by him are correlated to his current life and milieu, and to a certain extent also condition his dilemmatic perceptions of the philosophical conceptions of the Renaissance or the Far East. From the beginning, the work of Vahram wants an elegant Praise of Folly. A gentle madness, as is evidenced by the many ships of fools sailing on the terra firma. Stationary boats, they do not need to anchor and not likely to fluctuate or, a fortiori, to sink. They do not advance nor retreat and go nowhere. Or rather, they have arrived in this country has always elsewhere outside our space and our time, Geography and History, what the Vahramie. The clothing similarities with some known periods are a ploy to make us believe in the reality of this world shifted totally theatrical, as evidenced by the curtains often used to appear and disappear wacky characters, mostly hidden or fitted with masks sleeves, this enigmatic Commedia dell'Arte. Vahramie in the laws that govern our universe are optional, those of logic and plausibility as those of gravity there will provided that levitates a little musician. In this world of pure exhibition, verbal communication is unknown, the silence of rigor. In the absence of speech, it is a complex network of viewpoints which establishes a certain narrative coherence among characters locked in themselves and, if they graze, never meet as if they were flying lines parallel space and time. The work is unknown in this land of plenty reign only recreation. It spends its time to go in full dress or suit without at all, pinch the lute or harp, blowing into his flute, beating time on his drum, playing hide and seek, hoop, darts, bowling, puppets. Perhaps this strange and ideal society of idlers is it ultimately a puppet show and the painter is it that the chief puppeteer, able both to fade and get value, mixing appearance and reality: what are avatars of the divine painter choreographer these showmen articulated figures, these impassive -pullers. Like him and the characters who engage in this mode found wandering life, their motto is: Do what you like. All this parade, all these wanderings happen almost on a single scene: the terrace of the artist, for background decor, fruit filled or depleted depending on the season or the mountain scenery which closes the prospect trees. It is here, on this open nature, the artist terrace, projecting the film of his imagination, recreates the world in the measure of his dreams, in the form of Thelema in Vahramie. 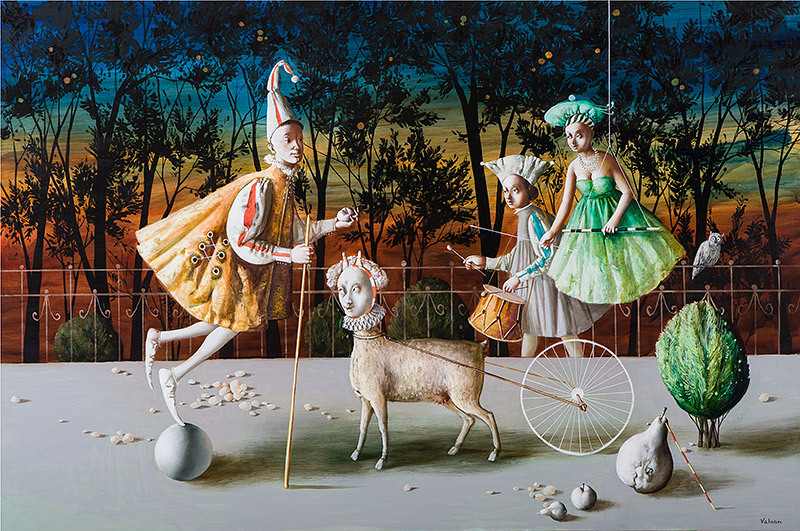 Vahram Davtian paints a world that he created with his imagination. This world lies beyond time and space, and only the artist has a key to it. We, the viewers, can judge about this hotbed of life, as it were, only through paintings of Vahram, the only person capable of penetrating this world. Despite the fact that inhabitants of this world could be with a certain irony called almost realistic, events and activities in the paintings have none of time coordinates—it is impossible to determine either the time of day in them or the season. The artist skillfully uses all these artistic devices in order to bring to the foreground the main idea of his canvases—the depiction of plasticity. Vahram’s paintings can be certainly called “plastic passages”. The notion of plasticity in the real world implies the smooth malleability of matter that creates an impression of the slowing of time and unhurriedness of events. This is exactly how the characters of Vahram’s appear—indolent and contemplative, imposing and graceful at the same time. 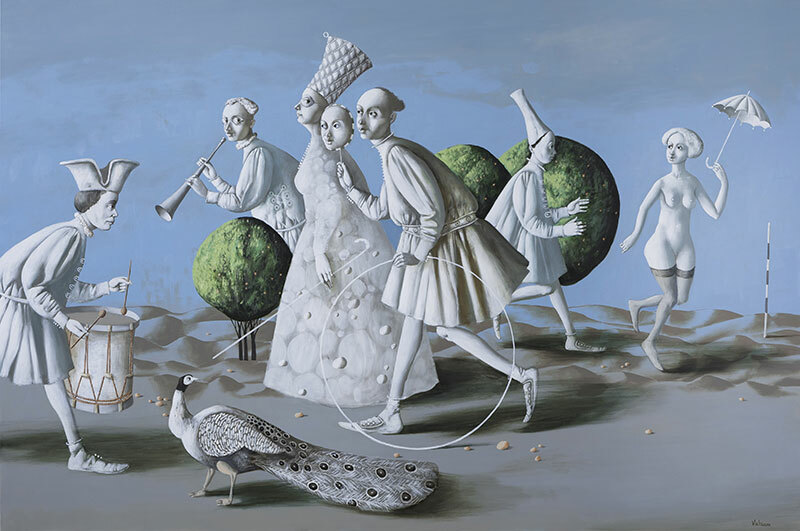 The development of possibilities of the figurative plasticity leads the artist into the world of carnival costumes. And this seems logical, for the clothing, especially if it is elaborate, with sumptuous forms and whimsical accessories, provides a whole field of action for a creative person and a beneficial source for artistic experiments. 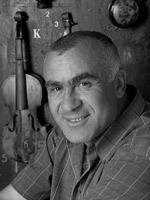 Technical capabilities of Vahram Davtian as an artist are at the highest level; he creates his works with the method of multilayered painting, the very same that was used by the Old Masters and the only one that allows to convey the depth of colors and to reflect the maximum of their gradations. The perfect mastery of the technique leaves the artist more time to develop the subject matter and to submerge into the world that he created and to study its laws. In part, the laws are dictated by Davtian himself: he leaves three-dimensional space to his characters, even “throws” some domestic objects into it, but he changes the law of gravity—he puts the characters into a state similar to that of weightlessness. A question arises: how to express the interaction of characters and objects on a canvas’s plane? And the artist Davtian finds his own solution—he creates the method of figurative plasticity. 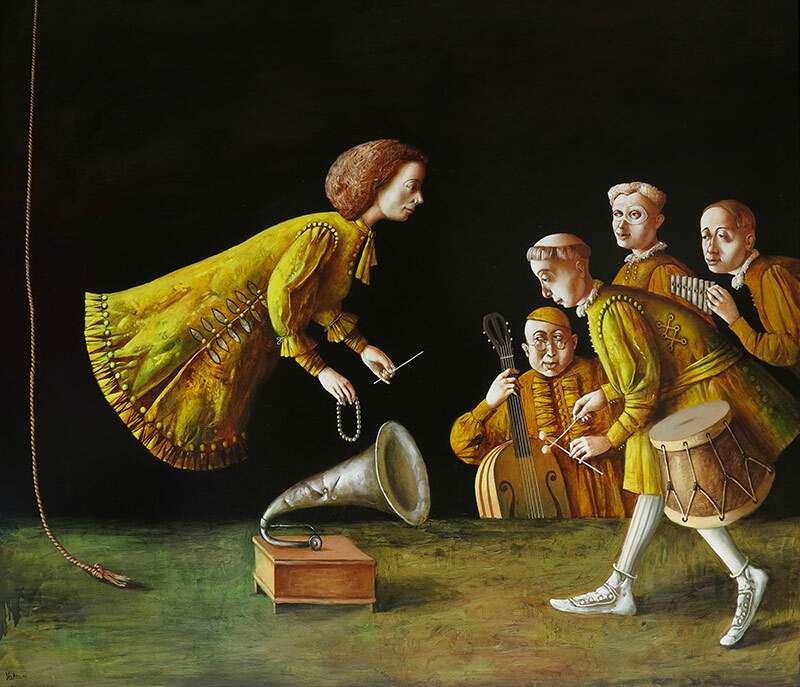 Having found “the key”, possessing the technical capabilities and being endowed with a natural talent, the artist, armed with patience, expands for us the borders of his fantastical world with each new painting. Surrealism is, by nature absurd, and the work of Vahram takes the genre to a new and exciting level. 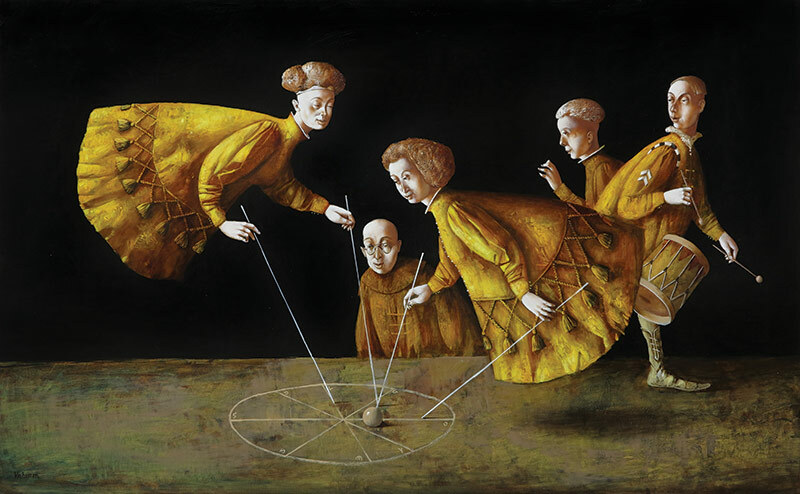 Anchored in the Flemish tradition of painting and influenced by Renaissance Art, Vahram’s images are both whimsical, at times haunting, and clearly contemporary. For those of us who did not personally live through the end of the Cold War and the break up of the Soviet Union firsthand, each of Vahram’s paintings is not only a visual masterpiece, but a history lesson. Filled with historical references which are easy to decipher and stunning to the eye – horses, pomegranates and masks abound—each painting in its unique way draws us in and makes us think. Not unlike members of Andre Breton’s group, Vahram is a thinker, a poet and a philosopher. His subjects are whimsical and always bursting to tell us their stories. The artist’s use of color to define not only space and time, or perhaps the lack thereof, as well as the human personality in the context of history, is nothing short of extraordinary. 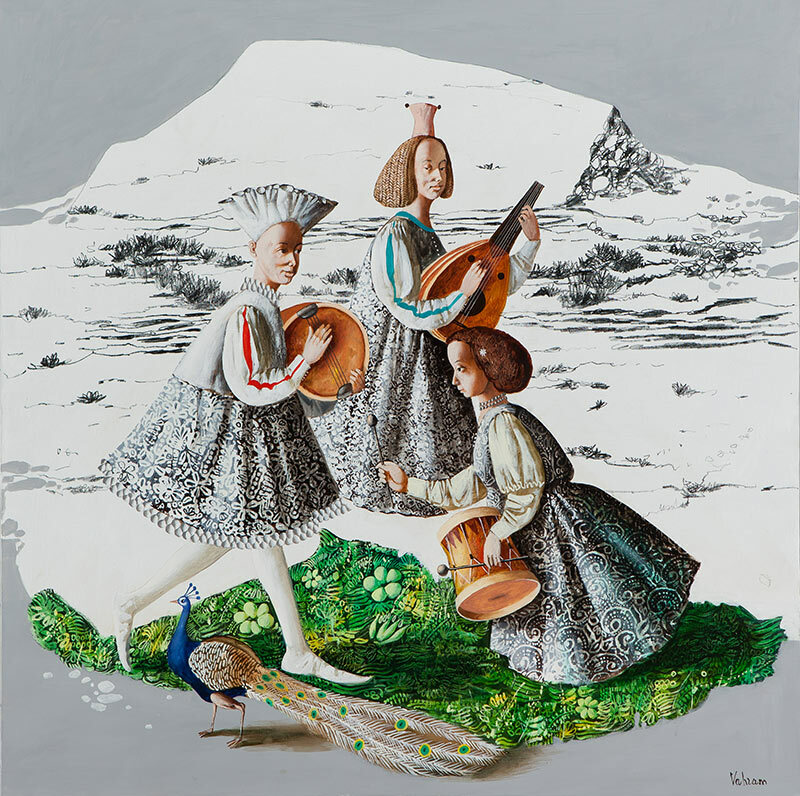 The talented Post–Soviet artist is telling us on canvas in his own unique way, that the absurd realities of the past continue today. One can only hope for world peace to weave its way into the masterworks of Vahram. 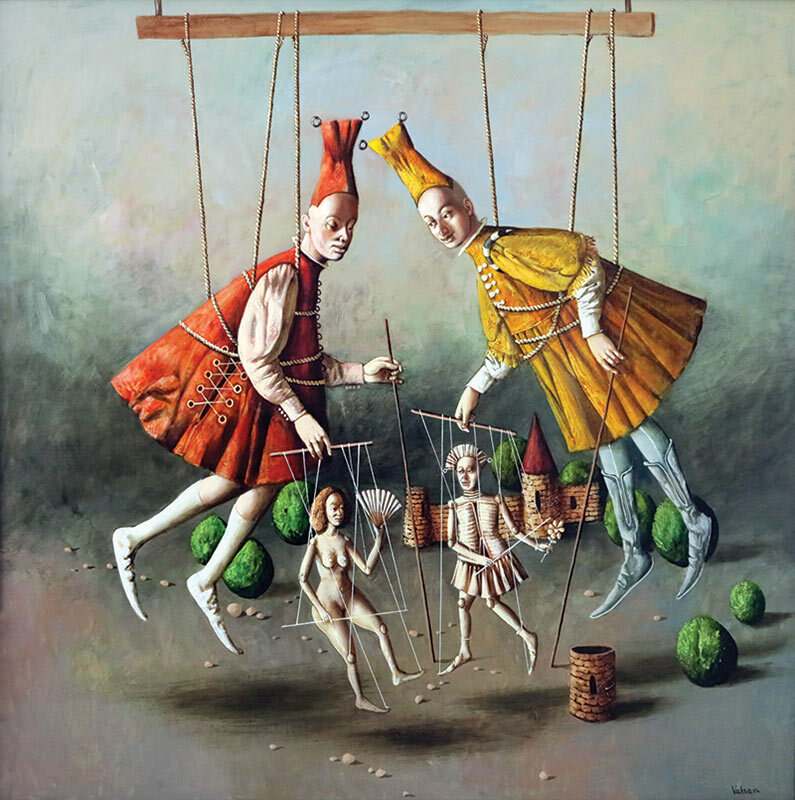 Vahram Davtian is an artist who moves between magical realism and the absurd. His artworks come from a clear and smart technique which shows a dreamed and strange world full both of irony and nostalgia. Aristotle said that in art it is necessary to lie for saying the truth which means that saying a lie the artist builds a truth, creates it, constructs a new paradigma. Vahram’s paintings are meant all the time about that. They are scenes of daily and mostly ordinary lives which open wide ways to new possibilities and self projections of our own lives. I have been so proud for the chance of showing these artworks at Arteclasica 2007, the works of an emblematic contemporary master in the Post–Soviet world. It was “love at first sight”! It is difficult to find the words to describe my admiration and surprise of his marvelous work; his paintings were magic... You could not stop looking at them.